I have fond memories of buying a large jar of honey on a similar, or even the same market. The old lady was standing behind dozens of unlabeled jars, stacked in five or six layers. There were no two jars that had the same size or shape, even the honey in each of them had a different shade of gold. Whenever I inspected one, the old woman would unscrew the lid, drop some honey on a piece of paper and hand that to me. I bought the largest jar of the creamiest honey and I still smile when I think back at how our means of communication were very limited, but we knew we found each other in our love for honey. 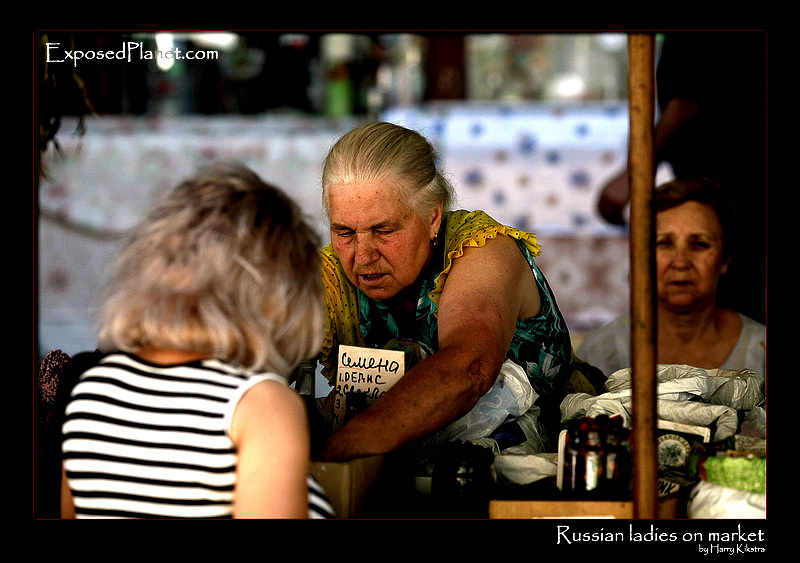 The story behind "Russian ladies on the market"
After the landscapes I will post a few images of the local people in Kislovodsk, the city at the foot of the Russian Caucasus. There are some big markets where everybody is trying to sell everything to everybody. There are hardly any tourists here and English is generally not spoken. Still the people might be a bit suspicious at first, especially when seeing some cameras, but always friendly as well.